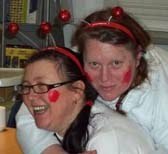 Hi Guys, did you have a good Red Nose Day? Coo was poorly so Looby came to stay and keep an eye on things (they managed to pop in for a wee while later on!). 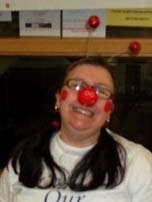 Meanwhile, I grabbed my wee red nose and set off to my charity event as planned! We had been planning it all for months. The event was held in our local community centre and was a...Community Get on your bike for Comic Relief. We used four exercise bikes and had them running from 9 a.m. all day right through till midnight! Here's my friend Gill and I pedalling hard and it was a couple of hours in too! The local Primary Schools sent children to take a turn and the community all rallied around to make sure the wheels kept turning! We all worked really hard to make sure it was a fun day. Here we are having a bit of a giggle in the last few hours (minus the 'noses' tut-tut!). You can see from the pics, we had a ball! Best of all...we raised some much needed money for charity too so...job's a good 'un! I hope you enjoyed the 'Red Nose' adventure, it sure was fun! Looks like fun. I can only got 2 miles at a time on my exercise bike so I would not of made it very long. Congrats on a great job.